Another easy project... using leftover yarn from the "Brownies for Breakfast" sweater I finished earlier this week, I decided to use up some of the remaining yarn, and make some Wrist Warmers. I don't know if these qualify as Fingerless gloves or mittes, just because they have no thumbs. Basically just a tube, with Thumb Openings. The pattern is loosely based on some of the fingerless mitts patterns I found on ravelry, loosely in that I used them to decide how many stitches to cast on, and how long to make them. The cable itself is one that I learned to to a very long time ago, and can be found on the Aran Afghan that lives on our couch in the living room (which I was curled up under when I decided I should try knitting a pair of these!) 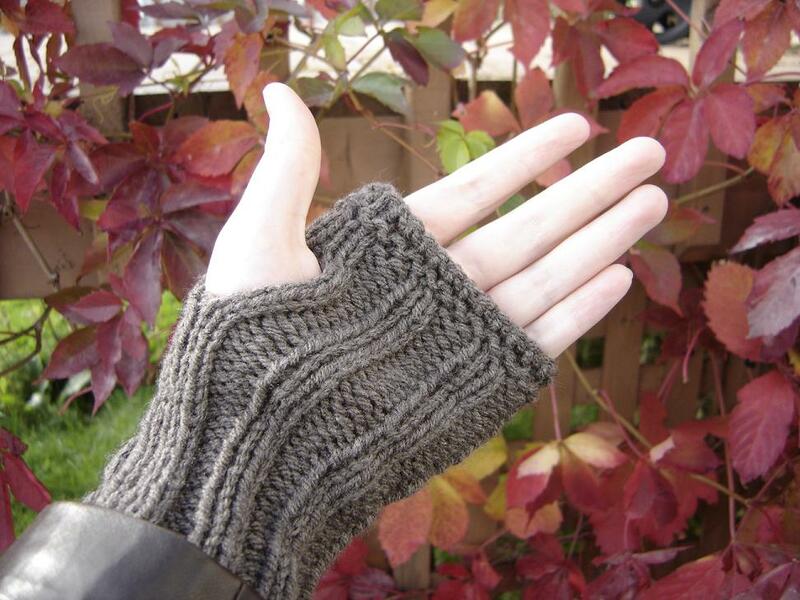 The back of the mitts is done in K2 P2 Ribbing for maximum stretch and comfort. Pattern to follow, when I get a chance to turn my chicken scratch notes into somethings other people can decipher. If you like the mitts, and would like a pair... they are for sale! please go to my etsy store: www.JoboDesigns.etsy.com !